On Saturday, June 29, 2013, an investigator for SHowing Animals Respect and Kindness (SHARK) attended and filmed at the Cowtown Rodeo in Pilesgrove, NJ. A number of bucking horses were electro-shocked. Shocking is prohibited by the Professional Rodeo Cowboys Association (PRCA), which sanctions the Cowtown Rodeo. However, as SHARK has proven over the past two decades, PRCA humane rules exist for public relations purposes only. SHARK investigators regularly find animals shocked at rodeos, with PRCA judges fully aware of what is going on. SHARK has exposed that horses are shocked at the Cowtown Rodeo since 2008, but the PRCA would do nothing. During Saturday's Cowtown performance, one of the shocked horses subsequently collapsed, went into convulsions, and died. The type of shocking device used on the horse can deliver about 10,000 volts of electricity. Miller Manufacturing, makers of the prod have clearly stated previously that the devices are not to be used in a rodeo environment, and are never supposed to be used on horses under any circumstance. Rodeos, such as Cowtown, regularly use the electric prods to make tame, domesticated horses appear wild from pain. TMZ has covered this and the running poll they have, asking if rodeos should be banned, has already received more than 42,000 votes! You can read the TMZ story and please vote on the poll HERE. Please also note that the owner of Cowtown was not being honest in the TMZ story when he said that horses aren't being shocked. We will soon be releasing evidence from that night showing the electric prod being drawn back from the horse and down after the gate was opened. SHARK also caught horse shocking at Cowtown in 2008 in THIS VIDEO. Note in that video how they were actually electro-shocking horses in the rain! For the third year in a row, the Reno Rodeo has been caught using electric shock prods. The images come this time, not from a SHowing Animals Respect and Kindness (SHARK) investigator, but instead from a former reporter for the Reno Gazette Journal who was sitting close enough to get clear images with her cell phone. 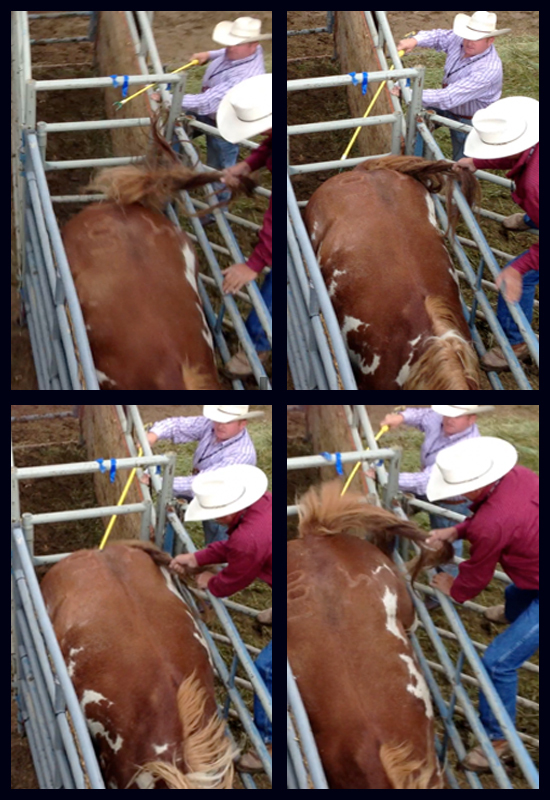 The images depict one individual holding a horse's tail up, while a second individual applies a large electric prod to the genital area of the horse. Recently, Reno Rodeo president, John Tipton was quoted in rgj.com as saying, "Livestock prods will be banned in and around the rodeo arena, and anyone found using them will be removed." Rodeo spokesperson Steve Schroeder was also quoted saying, "Regardless of SHARK attempting to gain further notoriety for asking these questions, the Reno Rodeo has a no-shocking policy." "Reno Rodeo Association President, John Tipton is responsible for allowing this abuse," states SHARK president Steve Hindi. "Banning cameras gave rodeo personnel a green light to continue the abuse. Cruelty charges should be filed, but it seems that no one in any level of authority within law enforcement or the legislature cares about the animal abuse." Rodeos like to say that they are a "sport," but if they were, there would be an oversight agency, as most sports have, to investigate violations and take action. Instead, what we have is the PRCA, more of a hack PR firm than regulatory body, and we know this because if the PRCA was really concerned about protecting animals, then they would have filed numerous penalties against the Reno Rodeo, as well as all the other rodeos SHARK has exposed, including Cowtown. You can read the story about this HERE. Please note that everything Ellie Lopez-Bowlan stated is true and SHARK has the evidence from her video to prove it. In the latest article from the RGJ, the Reno rodeo is once again refusing to release the name of the man shocking the horses. Last year SHARK identified him as Donnie Castle and he is back again this year. Read the rest of the article HERE.